Decreasing budgets, an increasingly mobile workforce, limited staff, time constraints, a growing dependence on e-solutions - you face unique challenges as an IT professional. And you can't afford to disrupt your end users or clientele to implement security solution after security solution. That's where the IT Security Kit comes in. This handy kit provides everything you need to quickly and easily find the antivirus product that's manageable, reliable, cost-effective and just right for your organization. This guide provides easy-to-deploy testing criteria to evaluate antivirus solutions from both the administrator and the end user point of view. Simply set up a machine to install the management console software, pick a sample of the different types of machines you manage and install agents on these test machines to compare solutions. 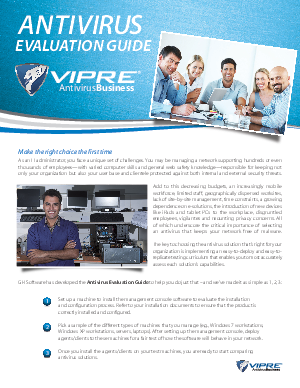 Unhappy with an antivirus that interfered with user productivity during scans, Mitsubishi Polysilicon's IT Manager turned to VIPRE® Antivirus BusinessT. He found that VIPRE was easier to deploy and manage than his previous product, users never experienced downtime or interruptions during scans and the technical support offered was second to none. VIPRE is the small-footprint antivirus that leverages the most advanced detection technologies to protect against viruses and other malware threats in real time, delivering fast and efficient endpoint security with minimal impact on system performance. Try VIPRE free for 30 days and see why IT professionals worldwide rely on it to protect their organizations. Fill out the form to download the IT Security Kit.